The chart above looks at the long-term growth of US small-cap value stocks in relation to the overall market (S&P 500 Index) and inflation (CPI) since 1927. 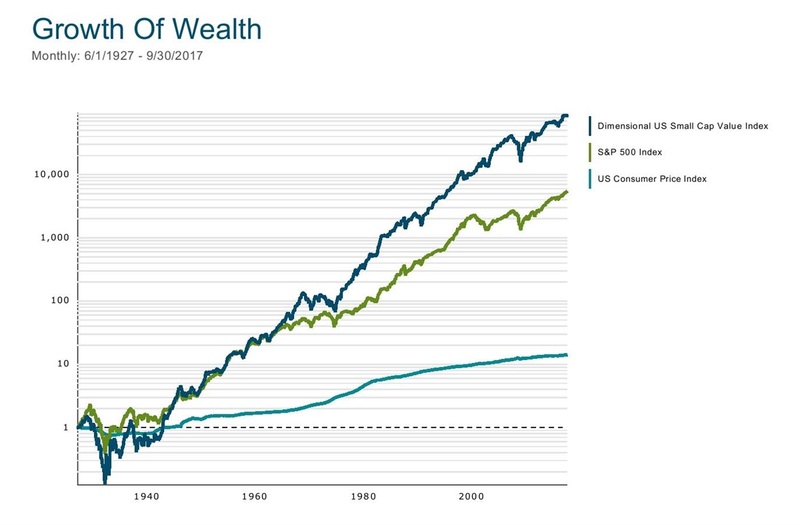 Small value did +13.5% per year compared to 10% for the S&P 500 and 3% for inflation. This was enough to propel a $1 in small value to $89,866 compared to $5,473 for the S&P 500 and $14 for inflation. What relevance to modern investors is a 90+ year sample of historical returns that includes decades from before you were even born? Plenty, it turns out. Over the last 5 years, the DFA US Small Value Fund has compounded at +13.7% per year, the DFA International Small Value Fund has returned +13.5%. We don't know exactly what future returns will be. But ignore the past at your peril.